Flexible and modular, the Link programme meets the organisational needs of spaces of any dimension and configuration. Three types of die-cast aluminium joints connect up to legs and horizontal elements thanks to a fast and safe assembly system, producing numerous formal combinations. 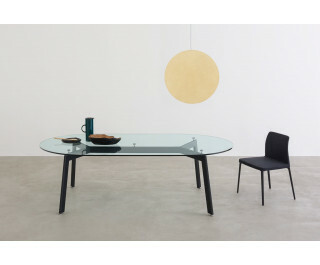 Modular tables with top in glass (clear, opaque) or natural oak. Steel structure and die-cast aluminium joints.